Kosuge-mura is the village of the heart of mountain in Yamanashi-ken. Kosuge- no-yu is the hot spring relaxation facility run by Kosuge-mura. It is a building like a old elementary school in the country. 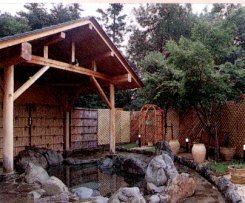 There are the bath made of Japanese cypress, Jacuzzi, cascade bath, a sauna, lying bath, an open-air bath. Because the time when we arraived there was late, we can not take the bath at our leisure. 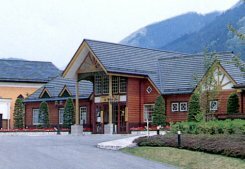 A building like a log house and equipment are comfortable. The courtyard surrounded by a school corridor is a herb field. Some benches are put around the herb field. Vegetable direct sales were done in the parking lot, too. Get off Cyuol expressway Ootsuki IC, and go north along Route 139. The hot spring is in the point where it got over Matsuhime pass. About 35km from Ootsuki IC. You can get on the village- run bus from Okutama station of JR.